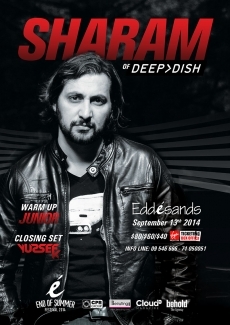 Edde Sands “End Of Summer Festival 2014” presents DJ Sharam of Deep Dish. DJ Sharam is a progressive house music DJ and producer. He is one of the Grammy award winning- duo Deep Dish. From underground classics to scoring international chart toppers, DJ Sharam seamlessly navigates between hypnotic underground sets rooted in his rich history of house and techno. 80$ Golden Circle including 2 drinks. 40$ Standing including 1 drink.